Trade customers should login or sign up for trade customer registration. As a buyer you will be confronted with confusing information and marketing strategies. At Back Care Beds we aim to give straight honest advice and the best quality products. On our website you will find 'build an adjustable bed', an easy to follow step by step guide where you can select from the eight options to create the perfect adjustable bed to suit your requirements. Do you want single or twin adjustable beds? The size of your adjustable bed or adjustable beds. The colour of the adjustable bed base and headboard should you require one. Most importantly, the adjustable bed mattress. Choose from our range of five. Treat yourself to a headboard to enhance the look of your adjustable bed. Would you like storage in the base of your adjustable bed with dovetailed drawers? Any additional accessories? Massager, sheets, spare washable top or anti sweat pad? Choose delivery or delivery and installation options. The results will show how your chosen adjustable bed or adjustable beds will look, along with the corresponding prices. Back Care Beds and High & Dry Waterbeds are divisions of High & Dry Manufacturing Ltd. With over 23 years of experience manufacturing adjustable beds and waterbeds to specialist shops around the UK. One result of the economic squeeze is that members of the public demand value for money, highest quality at the lowest prices possible. This is what High & Dry Manufacturing Ltd are proud to deliver. High & Dry Manufacturing Ltd have been producing waterbeds and adjustable beds at Batchmere workshop near Chichester for the past ten years of our twenty three year history. Sadly we have out grown the property. Sales of waterbeds have remained steady despite the recession but adjustable bed sales have increased to the point that we have had to purchase a bigger factory. The freehold property is located on a private road in the prestigious village of Almodington, close to Chichester, West Sussex and the beautiful beaches of Witterings PO20 7LQ. 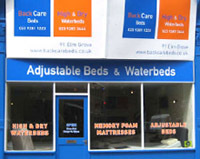 When High & Dry Waterbeds started in business back in 1988 during the reign of Margaret Thatcher, the intention was to sell waterbeds solely to waterbed shops. There were a few waterbed retailers that sold waterbeds through the Exchange and Mart and local free ads magazines. High & Dry Waterbeds made the decision not to supply these retailers for fear of upsetting the high street waterbed shops. There were a large number of high street waterbed shops and The British Waterbed association set criteria for waterbed shops to become members. High & Dry Waterbeds decided to lease a huge shop to sell waterbeds directly to the public; it would also be our trade waterbed showroom. By displaying a full range of waterbed mattresses in a variety of hardside waterbeds and softside waterbeds our own retail sales of waterbeds and waterbed mattresses exploded. So High & Dry Waterbeds had become a retailer and manufacturer. All waterbed businesses advertised with Yellow Pages. Should we move the retail of waterbeds and adjustable beds from Portsmouth to our workshop in Chichester? High & Dry Manufacturing Ltd has had a waterbed and adjustable bed showroom in Portsmouth and Southsea for the past twenty two years. Times are changing. With congestion and parking problems the days of the high street shop are numbered. We could move to our factory in Chichester, West Sussex where we already have a waterbed, adjustable bed and nursing bed showroom. The deciding factor was that most business comes from our existing adjustable bed and waterbed customers either by recommendation or repeat business. We have a data base of over eight thousand existing customers. It would be easy to contact them for future business, but a percentage of these customers would not receive the news. If we do sell now we could lose a lot of business having become the only specialist waterbed and adjustable bed retailer in Portsmouth and Southsea. Despite having been offered very good money to sell, especially considering the current financial climate, we have decided to stay in Hampshire. With Christmas fast approaching we are having a stock clearance of our high quality Majestic range of adjustable beds to make space to expand our upholstery department. The Majestic is not a cheap adjustable bed because of quality, far from it. It is a cheap adjustable bed because we need to clear stock. The Majestic adjustable bed is finished in a nice neutral Belgian damask. Complete with the highest quality 5 part adjustable bed mechanism and many optional extras to tailor this cheap adjustable bed to suit your requirements. Price reduced by £221 to just £379 excluding VAT (If you suffer from certain medical conditions you may be exempt.) 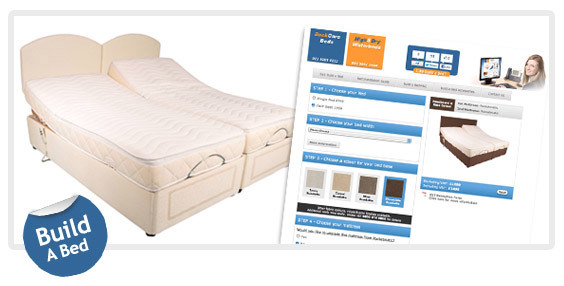 The price includes a pocket spring or Reflex foam mattress which can be upgraded to a memory foam mattress making this an extremely cheap adjustable bed. We will also be clearing stock of our Olympia range of cheap waterbeds. One of the things that set’s High & Dry Manufacturing Ltd apart from other bed manufacturers is our ability to respond to customers needs. We have supplied waterbeds and adjustable beds to trade customers and also sold waterbeds and adjustable beds directly to the public for over twenty two years. We receive constant feedback through our waterbed and adjustable bed shop in Southsea and we respond to that. Fashions change. There was a time when every third waterbed we sold retail had a metal headboard or bedstead. Now this is more like one in a hundred with customers opting for their waterbed or adjustable bed to be upholstered in one of our four popular suedette materials. Many other fabrics are also available for the waterbeds and adjustable beds depending on the look you wish to achieve. With many styles of headboards to choose from, either Upholstered Upholstered or a great range of hand made Pine Headboards and bedsteads so waterbeds and adjustable beds can match existing furniture existing furniture. 5’ x 6’6” Olympia Deluxe, Eva Headboard, 4 drawer Unit, Mink Suedette with a 95% Super Stable mattress. High & Dry Waterbeds is the retail division of High & Manufacturing Ltd. We have been manufacturing waterbeds for over twenty two years. Originally we only intended to supply to waterbed shops. We soon found we needed a waterbed trade showroom so retailers could choose the waterbeds for their own waterbed shops. As a result retailers have been against their waterbed supplier directly competing with them as they obviously can not match our factory prices. With the growth of the internet, and the decline in the number of waterbed shops in the country, High & Dry waterbeds will now supply a new low cost range of waterbeds available exclusively to the public. With prices for a softsided waterbed from £699 click here to build your own waterbed online. Waterbed mattresses and other waterbed accessories are now available on our waterbeds section of this website. Our previous latest news left the question, how could we keep the low price of our adjustable bed mechanism whilst maintaining quality far higher than industry standards? The answer is a sad reflection of the state of British bureaucracy. The promised cut in red tape never happened, it worsened. By increasing our production in our own Bulgarian factory, our adjustable bed mechanism overheads will be realistic instead of more than 50% of the cost being government tax. A controversial decision, so sensible comments on our latest adjustable bed blog post are welcome. Please click here to post your thoughts on our bed blog. High & Dry Manufacturing Ltd has three divisions. Adjustable beds, waterbeds and nursing care beds. The focus of our September progress meeting was to make our adjustable bed mechanism the best available and how to achieve a price point that can't be beaten. "There should be no sensible excuse for a wholesaler, adjustable bed manufacturer or member of the public to choose a competitors mechanism over ours!" Because we will not compromise on quality, the material cost of each component of our adjustable bed mechanism is far higher. So how will we do it? The answer is efficiency! How to acheive this will be in our next news. Specifications of our adjustable bed mechanism can be viewed here. With the VAT increase looming purchases made after the 4th January 2011 will have 20% VAT added. How does that affect you? Prices will have to go up. Many of our trade customers are already struggling to survive, maintaining competitive prices through reduced profit margins. Back Care Beds are a manufacturer and so work on much smaller profit margins which are already at a minimum. Adjustable bed customers often qualify for VAT exemption. Although the adjustable bed itself maybe VAT exempt headboards, drawers and other accessories are not. On a typical single adjustable bed sale with VAT Exemption, prices may rise by only £2.50 Hardly worth worrying about. On a typical single adjustable bed sale without VAT Exemption, prices could rise by £17.50 and £35 when buying Twin Adjustable Beds. On a typical waterbed sale expect an increase of approximately £25 despite the medical advantages of a waterbed VAT exemption is not available on waterbeds.. In light of Craftmatic going into receivership we have decided to reassure our customers confidence when buying an adjustable bed from 'Back Care Beds'. Pay only 10% deposit (a credit card payment is additional security for you) The balance can be paid on installation once you are delighted that you have a better quality adjustable bed for approximately 1/5th of pressure sales companies. For more information please contact Back Care Beds. In our opinion it is obvious that over engineering of every component is far better than penny pinching. Dealing with complaints, supplying replacement parts and repairs cost more money than doing it right in the first place. Our manufacturing of adjustable bed mechanisms in Bulgaria, (the gateway to Europe) is expected to be online by August 2010 after hitting a few initial snags. So production of our adjustable beds and waterbeds from our UK factory in West Sussex is continuing as normal. We are preparing to take on new retailers that are selling related products. To improve our service, we are working with Aquastatus waterbeds in Newport Wales to kit out their showroom with a full range of adjustable beds, point of sale literature and training. We are looking for a second Factory in central Europe to open and expand UK manufacturing of mattresses, adjustable electric beds, nursing beds and waterbeds! Despite the economic climate High and Dry Bed Manufacturing has been thriving! Because of this we are researching how best to maintain giving all customers the lowest possible prices for highest quality adjustable beds & waterbeds.